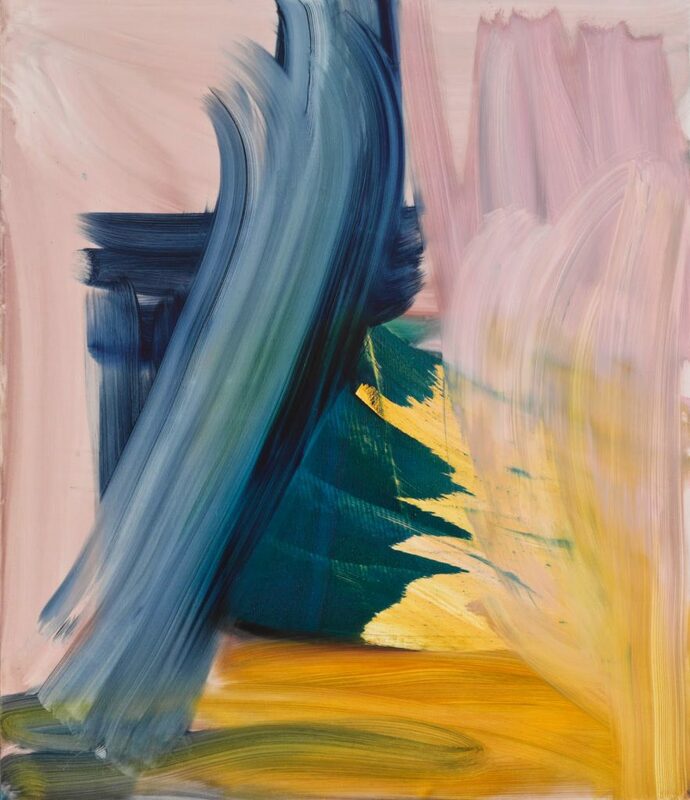 In a loft overlooking West Broadway in Tribeca, Andrea Belag employs large swooping brushstrokes and rich transparent color to create the illusion of space and light. 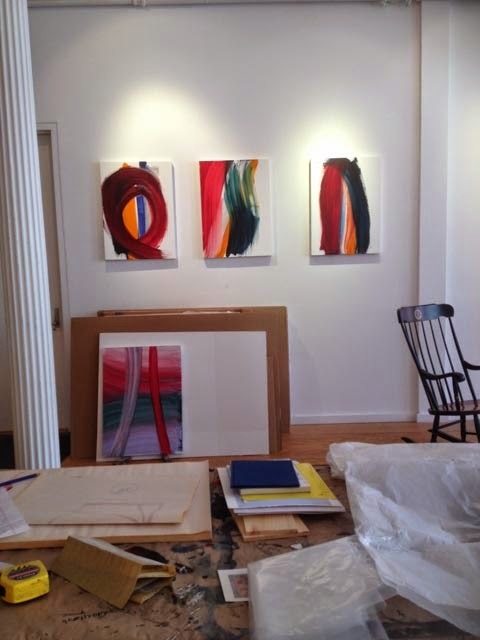 When I stopped by the other day she was in the process of selecting work for her upcoming show at DCKT. Belag’s process begins with color. When she was in Japan last year, she found a pocket-sized catalog of color combinations (above, on the table), and the colors for her paintings are chosen directly from the book. Thinned with stand oil and Dorland’s Wax, the paint, mixed in plastic food storage containers, is transparent and deeply saturated. To avoid dripping, Belag lays her stretched canvases flat on a table, where she applies the paint with different tools, including a huge, 18-inch wide brush, spatulas, and various painting rags. Belag’s brushes soaking in medium on the window sill. Working on a table affords Belag greater freedom of action than she would have if the painting were on the wall. She walks around the painting as she works, dragging the brushes as she goes. After the paint is dry enough, usually the next day, she props the canvas against the wall so that she can finally see how it looks. Ideally the color and brushwork coalesce into a convincing simulation of space and light. Belag is interested in the accidental and handmade, but when the paintings start to look too labored, she either wipes them down or, if they’re too far gone or already dry, takes the painting off the stretcher and starts with fresh linen. We talked about ancient Chinese landscape paintings which were created in one go, and Belag mentioned that a visit to Kyoto’s Zen gardens last year had had a big impact on her work. 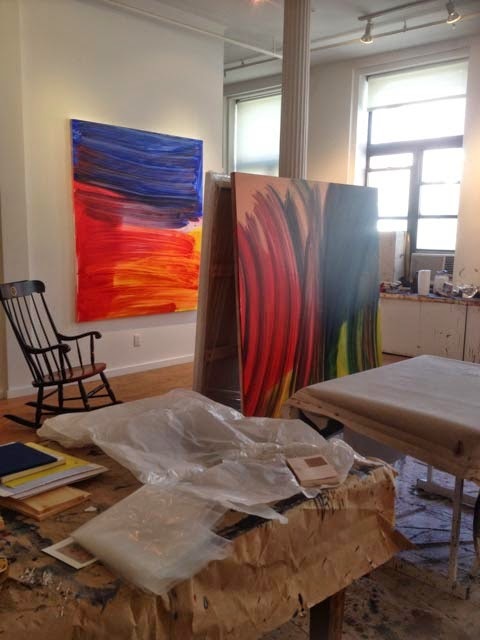 She also cited Mary Heilmann, French conceptual painter Bernard Frize, early French abstractionist Hans Hartung, and ceramicist Takuro Kuwata as important influences. 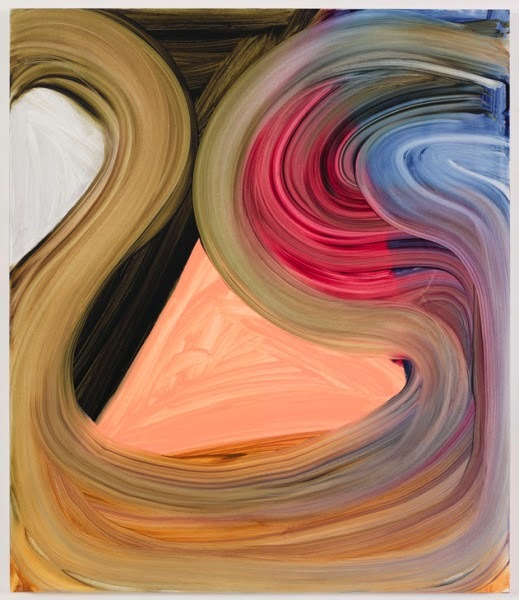 Andrea Belag, Close, 2014, oil on linen, 56 x 48 inches. 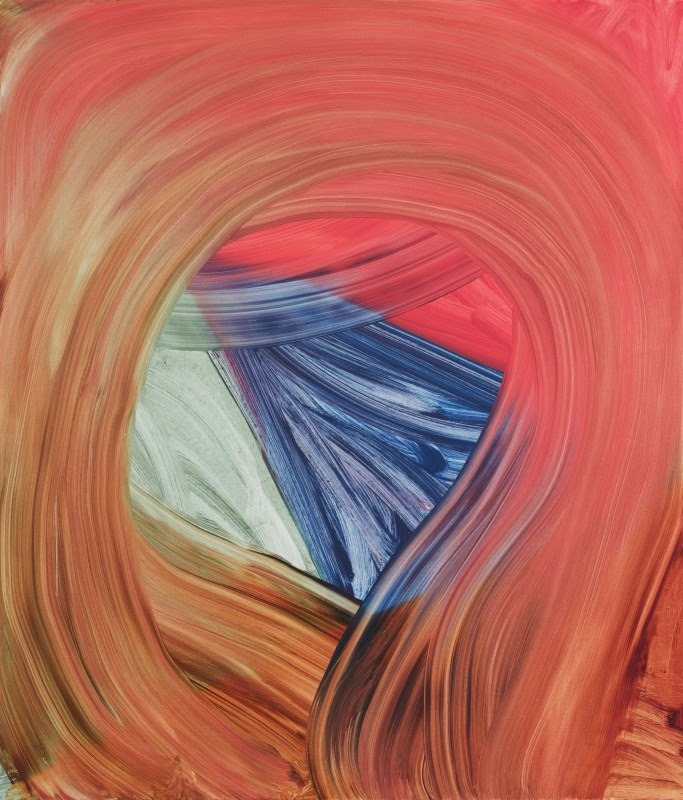 Andrea Belag, Crane & Tortoise, 2013, oil on linen, 56 x 48 inches. first daub of paint has dried, but, in a classical sense, they are fully realized and complete. 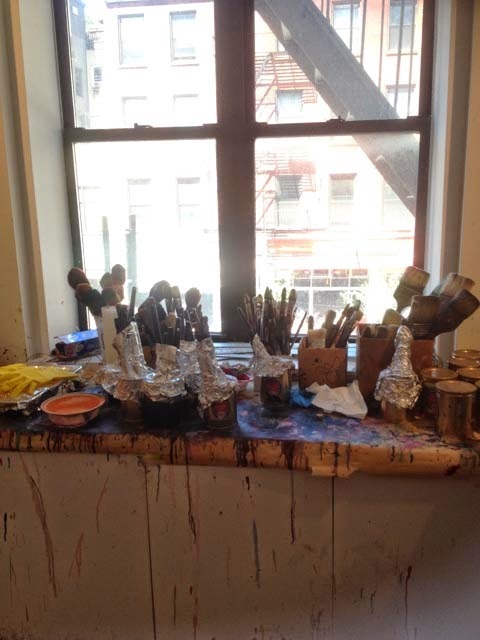 “Andrea Belag: S, M, L, Recent Paintings,” DCKT, LES, New York, NY. Opens this Thursday, June 5. Through July 18, 2014.
to paraphrase Borges, as an artist gets older its not that the work gets simpler but that an economy of language has been achieved. Andrea has achieved that in her work now, hard won and evident. Lovely visit: thank you. 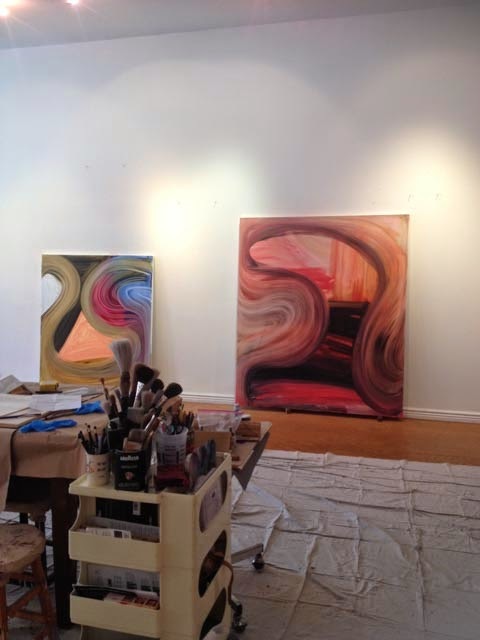 I've added your studio visit link to my blog post of Belag's wonderful show.